After having my bag stolen recently in Europe, just a few blocks from home, I’ve started to reevaluate the bags I choose to carry, both at home and while traveling. The good thing is that I am no longer nomadic, so I can own more than one travel bag. I’ve been researching and learning about the best crossbody bags for travel and I wanted to share the results of my research with you. In this post, we will share our tips on how to chose the best travel purse, with a focus on crossbody travel bags. What is a Crossbody Travel Bag? Why Consider a Travel Crossbody Bag? In the table of contents above, you can see each of the topics I have included in this buying guide. If you are curious about a particular type of bag or have specific questions, just click on the section that most answers your questions. My goal is to help answer any questions you have when making this travel purchase. Although I walk through individual reviews of all of our recommended crossbody travel purse and bags below, I recognize some people are short on time and want a quick solution. Use the table below to view our top recommendations. Each of these bags can be purchased on Amazon, and most of them can be purchased using Amazon Prime. This means free, or at least quick, shipping on items purchased when you have a Prime membership. There are a few primary options for bags to carry when traveling. Many people chose a travel daypack, similar to a small backpack, to keep hands free when traveling. Others want something that might not stick out as much, or make them look as touristy. A cross bag is one with a shoulder strap that is worn across the chest rather than over one shoulder. Cross body bags make good travel handbags because they can distribute the weight across your shoulder. And, they free your arms to take photos, to eat street food, or to shop, the same way a daypack does. Crossbody handbags also may be the best purse for travel because they offer a little more security and peace of mind. It is less likely they will be snatched off your arm. (That said, there are places where crossbody bags are not the safest, most notably in Bali. If renting a motorbike in Bali, please keep your bag in your motorbike seat or between your legs. Thieves grab and the bag while you are driving or riding and have been known to pull you off the motorbike.) A few of our recommended cross body purses are the best travel bags for Europe for a few reasons. Some of them because they offer anti-theft features. Some of them because they are more stylish, like many Europeans. Choosing a slightly more stylish bag might make you blend in more, and look like a local. A few months ago, a group of young men created a distraction while another young man stole my bag from me at a cafe a few blocks from my home in Girona. A friend implied that he was surprised it would happen to us when we are professional travelers. But, that’s the thing, it didn’t happen when traveling. It happened when I was at home, and feeling comfortable. When I am in London or Barcelona I stress about the bag I carry. I am always on guard. At home, I am not. I do think, though, that there are ways to feel less stress when traveling. One of the ways to do so is to choose a travel cross bag or a travel crossbody bag. Travel safe crossbody bags can provide that piece of mind. The goal is to find one that you feel most comfortable with, from a security standpoint and a style standpoint. As for style, casual crossbody bags are not out of fashion. Some of the recommendations we make are more casual crossbody purse options. They are options that could be great for home use as well as a women’s crossbody travel bag. Much like our recommendations for a travel daypack, I like the idea of a bag that you can use at home and while traveling. Most, but not all, of our recommendations, are intended for women. It’s still more common for women to wear a cross shoulder bag. That said, we will provide some recommendations for large crossbody bags for travel that are gender neutral, or that are men’s travel bags. Some people are okay with gender-neutral, good travel cross body bags. For a long time, all of my travel accessories have been more gender neutral. So long as the cross body travel bag is practical and suits your needs, that’s all you need. Some women, though, want something with a bit more style to it, and I can’t blame them for that. I am trying to at least attempt to be more feminine! That’s where I am right now. I have struggled over the last several years with how to find a practical travel bag that doesn’t look overly masculine. It’s why some of our recommendations are for a crossbody travel purse or are for more stylish crossbody bags for travel. The thing is that many people have the same travel issues – how to conveniently carry everything you need for a day traveling without being weighed down, or annoyed by your travel pack or travel purse. We’ve already offered advice on how to find the best daypack for travel, but here we want to offer advice specific to crossbody bags. Here, we provide advice on what to look for in a travel purse, including size, style, and features. As for style, we included some bags that are a dedicated travel purse and others that are not specifically designed for travel. Size: Some people will carry a small crossbody bag and a daypack. In that case, you need something small. If you don’t carry a travel daypack, then you need to pick a travel purse that is large enough to fit everything you carry with you in a day, including a camera, wallet, cosmetics, water bottle, and more. Try also to find something that is not too bulky, and lies flat against your body. Style: Who are we kidding, every one of us wants a stylish bag on our arms, even when traveling. This is why we have very typical crossbody travel bags as well as more stylish options that could be worn at home or while traveling. 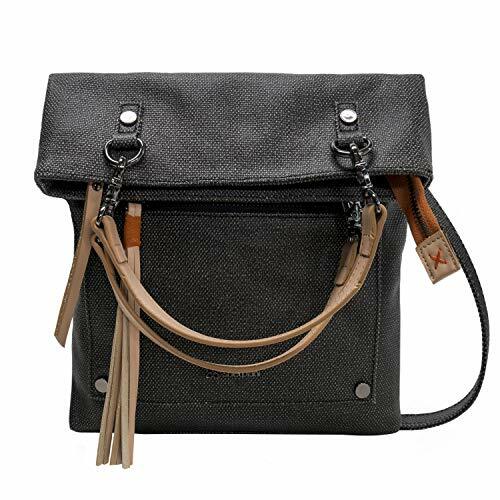 Obviously, a black crossbody bag is the most common and is a safe color choice. But, it’s not the only option! Don’t be afraid to go with something that is a little more fun or interesting. Material: Try to look for material that is lightweight and easy to keep clean. But, this depends on your destination. A leather cross bag could be perfect for travel in Europe and other city-based destinations. For a more tropical destination, think nylon or canvas, something that can stand up to sun and moisture (rain and humidity). Compartments: Having compartments in your travel bag will help keep you organized, so long as there are not so many pockets that it is confusing. This is really a personal choice. Anti-Theft Technology: In the end, anti-theft technology will not keep your bag from getting snatched, but it will prevent people from unzipping your travel purse or slashing your crossbody travel bag. A lockable compartment can keep things secure. More advanced bags even include RFID proof compartments to keep your digital information secure. In order to get a better idea of how much space you need in your crossbody shoulder bag, think about what you might need during the day while traveling. This can include a small wallet, phone, camera, hotel room key, and a water bottle. For me, that also always includes lip gloss or chapstick plus tissues (always carry tissues with you when traveling!). Depending on the destination you might want sunscreen, sunglasses, a selfie stick or tripod, an umbrella or hat, and maybe even snacks. As for a travel wallet, I try to carry one ATM card, maybe two credit cards and ensure my wallet is large enough to carry a lot of coins and bills that are larger in Europe than in the US. I might also have extra cash or credit cards in my hotel room, with my passport. I don’t carry my passport with me unless I have to. A lot of people have been talking about anti-theft crossbody travel bags because the technology is rather new. I am starting here because they are crossover handbags that are predominantly dedicated to travel, whereas many of my other recommendations can be used at home and for travel. There are two primary brands for anti-theft crossbody travel bags, Travelon and PacSafe. I will recommend one of each. The Travelon Anti-Theft Cross-Body Bucket Bag is probably one of the most commonly recommended crossbody bags for travel. All of the Travelon bags are practical and functional. This one, in particular, is large enough to hold a camera as well as everything else you need for a day exploring. It also comes in over 20 colors, including fun stripes, so it can be stylish as well. Travelon’s anti-theft includes slash proof mesh, a slash proof shoulder strap, and RFID pockets for credit cards. There are also locking zippered compartments. There is an adjustable should strap and the strap can wrap around a chair or post for extra security. 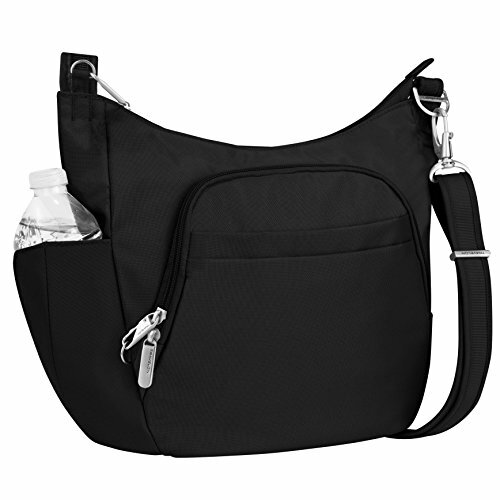 It’s also a great crossbody travel bag with water bottle holder. I like this because I carry water everywhere I go! How Does The Travelon Anti-Theft Technology Work? Whereas most of Travelon’s offerings are more for women, Pacsafe’s bags tend to be more masculine in nature, making them great crossbody bags for men. The Pacsafe Metrosafe LS200 Anti-Theft Shoulder Bag is labeled as unisex, but in the black it definitely looks more masculine (although they have other colors). 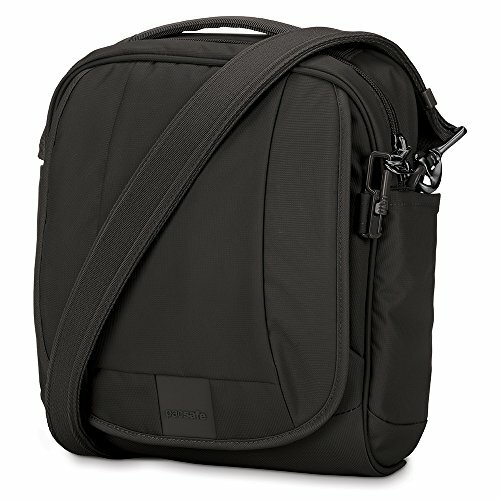 This bag is also a little smaller, and would only be able to fit a smaller camera or smaller DSLR. I think, in general, women just need more space. It does have a lot of great anti-theft technology, including a mesh body, wire reinforced shoulder straps, and RFID pockets. It can hold a 10″ tablet or iPad. It’s a little heavier than most of the Travelon bags. And, some people expressed concern about the turn and lock mechanism, that it is a little harder to use than the lockable shoulder straps on the Travelon. Check the best prices for the Travelon Anti-Theft Cross-Body Bucket Bag on Amazon now. 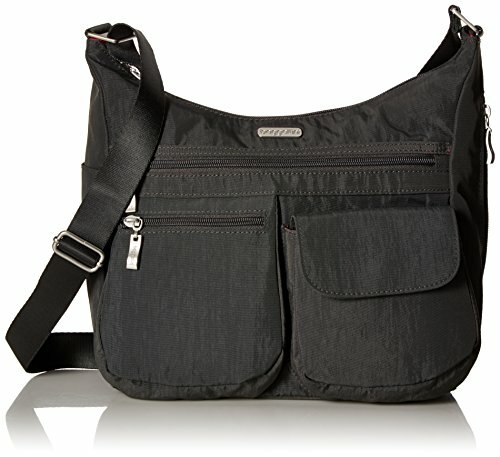 Travelon also makes a crossbody messenger bag for men, which is very practical, or a men’s anti-theft backpack. I know the backpack is not a crossbody travel bag, but it looks pretty slick to have all of those anti-theft features in it. Check the best prices for the Pacsafe Metrosafe LS200 Anti-Theft Shoulder Bag on Amazon now. 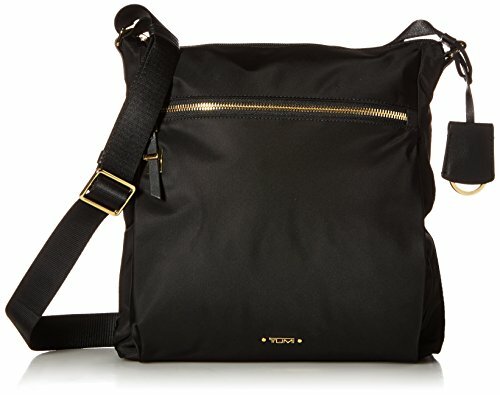 If you are not concerned about all of the fancy anti-theft options for a crossbody travel bag, there are some good options for lightweight cross body bags for travel. Simply by not having the anti-theft functions, that makes them lighter. I am going to recommend one light crossbody bag as well as some other options. I know a lot of travelers are focused on the anti-theft technology, but I am not entirely sure it is needed. This bag is the best travel crossbody bag without the fancy anti-theft technology. By removing the mesh that makes the bag anti-theft, the crossbody bag becomes a lot more lightweight. It offers similar compartments to some of the anti-theft bags and is pretty functional. The Baggallini Everywhere Bagg bag comes in about a dozen colors and is lightweight, weighing about a pound. It’s made of resistant polyester and can be wiped with a damp cloth to keep it clean. Even without all of the anti-theft features of the other bags above, it does have RFID features in the built-in wallet. It offers plenty of room and several external flap and zip pockets for security and easy organization. Check the best prices for the Baggallini Everywhere Bagg on Amazon now. Check out this lightweight crossbody tote bag for travel, the BOOMRO Crossbody Tote Bag, which weighs a little more than a pound and is made with water-resistant nylon. It has a crossbody purse strap and top handles making it super functional. It’s large enough to fit an iPad as well. Check out this lightweight leather crossbody bag, which can add a bit more style and only weighs about a pound. It comes in different color leathers as well, to match any travel wardrobe. This far we’ve been walking a fine line between functional and stylish, but I understand if you don’t want to be carrying a travel purse that looks like a travel bag. The next few recommendations will focus a little more on style while keeping in mind security and functionality. 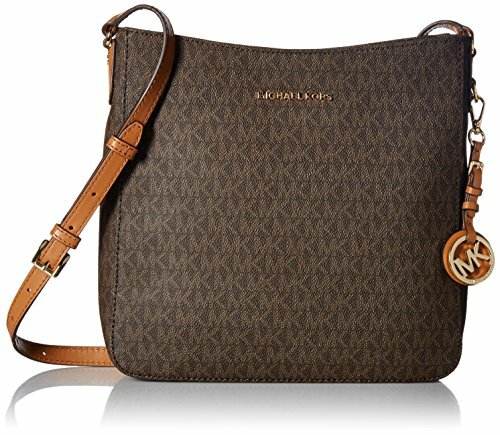 The MICHAEL Jet Set Crossbody Bag is a great blend of function and fashion. I like Michael Kors, and have a tote bag that I use for conferences and business meetings (yes I still have those), which can also fit my laptop. But, this women’s crossbody travel purse comes in both black and brown. It’s slim and not bulky, can fit everything you need for a day (except a large water bottle) but can also be used out at night, or to take to a nice restaurant. Because it is not a smooth leather, it’s also less delicate than other Michael Kors bags. This will keep it looking nicer longer. Tumi is a recognized name in travel bags and has a great reputation for quality travel bags. Traditionally, many of Tumi’s products catered to businessmen more than women travelers. This Tumi Women’s Voyageur Crossbody Bag for Travel is definitely a step up from the travel purses above, but backed by Tumi design features and reputation. The main compartment has a zip entry and the bag has three media pockets and an adjustable crossbody strap. It also has the Tumi Tracer, a program that helps to reunite Tumi customers with lost or stolen items. And, it only weighs a little more than a pound. Check the best prices for the MICHAEL KORS Jet Set Crossbody Travel Bag on Amazon now. Check the best prices for the Tumi Women’s Voyageur Crossbody Bag on Amazon now. Other options for designer crossbody handbags for travel include similar versions to the above, by Marc Jacobs and Kate Spade New York. Okay, let’s talk about some cute crossbody handbags that definitely work for both travel and home, and for the evening as well. First, when looking for cute crossbody purses many of them are a little too cute for me. I know not everyone wants a simply cute black crossbody bag for travel, like some of the designer crossbody bags above. That said, I also don’t know how practical it is to travel with a bag shaped like a pineapple, or a cat, or an elephant. Yes, all of those exist. The Sherpani Rebel Crossbody Travel Tote is adorable! And, I love cute small crossbody bags for travel that include a tassel. There is a main zip compartment with a mess of both exterior and interior zip pockets, as well as a pocket for your phone. It’s a crossbody tote, meaning there is a cross body purse strap as well as tote handles to carry on the wrist, which I love. 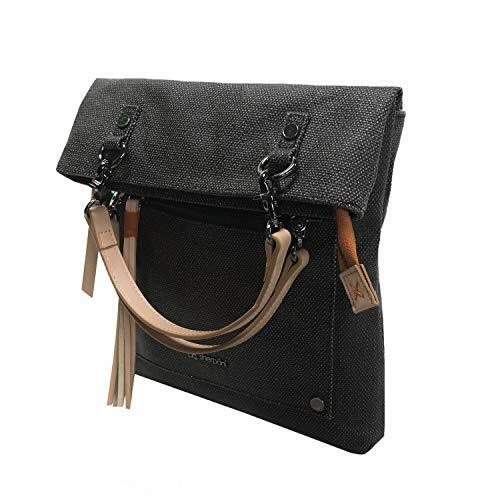 It comes in a dark grey color, making it great for travel, or a lighter, natural color. The Sherpani brand is also trying to work on using more sustainable materials and production methods. The Scarleton Chic Lace Style Crossbody Bag is slightly smaller in size, but it certainly is adorable. It comes in black, red, and coffee colors. For travelers who try to be sustainable, it’s made from synthetic washed vegan leather, with a little lace across the front. It’s also practical with a zipped cell phone pocket inside and a multi-function zip pocket. Best of all? It’s got a cute design without being shaped like a pineapple! Check the best prices for the Sherpani Rebel Crossbody Tote on Amazon now. 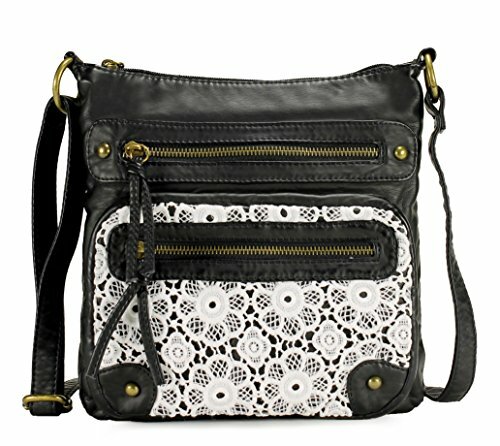 Check the best prices for the Scarleton Chic Lace Style Crossbody Bag on Amazon now. Do you need a dedicated travel cross body bag? Some people say yes, that your travel bag needs to do more than your at home bag. When you travel, you might need a bag to carry a camera, water bottle, map or guidebook, and other accessories. You might want a bag that has more pockets than normal to stay organized. I am not so sure. I like it when a bag can do double duty. It also means that when traveling I am more comfortable with the bag I have with me because I am used to carrying it. Is there anything I can do to make cross body purses safer? There have been incidents in cities like Kuala Lumpur where thieves have driven along the sidewalk and slashed the straps of cross body handbags. This is not common. But, if traveling to an area with incidents like these, wear your bag inside a sweater or lightweight shirt or under a scarf to make it less conspicuous. Do I really need an anti-theft travel crossbody bag? I personally do not believe it is necessary. That said, if it gives you peace of mind and makes you feel safer, then, by all means, go for it! Here’s a recap of the bags we’ve included above, just in case. Safe and happy travels all!